Are chocolate companies exploiting workers when they use a values-based approach to promote sales? Although some companies are clearly exploiting its workers, there is a difference between exploitation and smart marketing. Let’s compare the practices of Hershey’s Chocolate and Divine Chocolate to illustrate this point: The elements of exploitation exist in the practices of Hershey’s because they are advertising falsehoods and treating their workers as the opposite of what they market; Divine Chocolate is the polar opposite of Hershey’s in this manner because they market values that they actually practice, making them smart marketers – not exploiters. Is Divine Chocolate being exploitative? Exploiting in itself is deriving full use of something or someone unfairly (Alberts). Let’s first define exploiting for our own terms when it comes to thinking about chocolate companies – Exploiting is the act of a chocolate company using an element to maneuver, outrank, increase sales, or brand the company in a certain way without giving fair benefit to the people that they are using to achieve these goals. Before we analyze the possibility of Divine Chocolate being exploitative, let’s analyze a company that passes the litmus test for exploitation – Hershey’s Chocolate. By analyzing their pictures in advertisements and their marketing and comparing it to the real picture of the company, we can certainly see how Hershey’s Chocolate is being exploitative. The students, who were earning about $8 an hour, said they were isolated within the plant, rarely finding moments to practice English or socialize with Americans. With little explanation or accounting, the sponsor [Hershey’s] took steep deductions from their paychecks for housing, transportation and insurance that left many of them too little money to afford the tourist wanderings they had eagerly anticipated (Preston). How can Hershey’s not be an exploiter if international student workers, who are usually unfamiliar with the United States, cannot afford to even travel to the places that they wanted to see; these international workers took the job with Hershey’s in order to site-see in exchange for work, and Hershey’s is essentially taking that element away from them. Further, the promises that Hershey’s made to the students regarding a certain amount of money given to them was understood by the company to be separate from the housing, transportation, and insurance. Clearly, Hershey’s is exploiting the international workers by lowering their wages in order to get labor in the form of the cheapest way possible; these deductions would not even begin to cover a legal and livable way or manner if an American had this job. Thus, Hershey’s found a way to bypass the legal system in order to get cheaper labor – in the form of exploited international students. Additionally, one cannot even argue that Hershey’s has learned its lesson on this front – despite the media attention, public outcry, and protests from students alike, Hershey’s is still running this program; imagine the kind of exploitation that could be occurring in more vulnerable areas if this kind of company if this type of exploitation is happening in the United States. If the plant in Pennsylvania is seeing these kinds of abuses, it is safe to assume that the exploitation along the Ivory Coast and the Americas are seeing abuses that are hidden away from the public. This advertisement, at first glance, may not seem like a direct link to exploitation, but the company is promoting itself as a brand that is values-based. It draws upon the picture of a happy family and talks about how Hershey’s “good business” practices translates into better chocolate for the family, resulting in a “better life and bright future.” However, just from the proven evidence discussed regarding the student workers, the reality of Hershey’s is very different than what it is advertising. Clearly, Hershey’s is branding itself as a business that is “good,” however, it is not actually being a “good” business with values. In this picture, children of different ethnicities and races are being shown; Hershey’s is advertising themselves as a company that promotes inclusiveness across all kinds of ethnic and racial divides. For instance, it talks about how it puts different kinds of candies for all kinds of kids. However, the example of exploitation of its international student workers tells a very different kind of a story. How can a brand that claims to be “inclusive” not be inclusive to its international workers? How could a brand that would never be able to legally get away with reductions in paychecks and amenities for American workers be so inclusive if it takes a legal loophole to do so for its international workers? Clearly, it can be seen how just this one type of exploitation is being used in full force, which passes our litmus test on essentially all fronts. It has abused a sensitive group, misrepresents benefits to workers and unfairly promises them lies, and then brands the company in a way that misrepresents the brand to the consumer, whom otherwise would think that Hershey’s has excellent values just from looking at their advertisements; Hershey’s, knowing that most targeted and loyal consumers are not going to search for their name on the Internet every time they want to buy a bag or piece of chocolate, use this to their advantage. Divine has moved on from selling mainly on the basis of the solidarity value of its product to material use value taste. [Divine Chocolate] still is slightly more expensive as it must, other than the likes of Nestle and Kraft, fulfill its double bottom line of economic and social viability. So while the product is competitive on a level of quality, its price still needs to be justified in terms of justice or solidarity. In order to go beyond this, Divine [needed] to add symbolic use value to its brand, engage in consciously designed commodity aesthetic in order to push into unchartered mass markets (Binkley). Divine Chocolate, like Hershey’s, desired to push even further for profits for their already-successful companies so it could stay competitive; however, what makes it different than other companies is that it is a specialty type of chocolate in a specialty kind of market. In order to be competitive within those specific markets, Divine Chocolate desired to break and expand into the mass markets by justifying their price to those kinds of consumers. In turn, it created the Women’s Empowerment Campaign, which promotes the equality of women chocolate workers, in order to attract consumers (Divine Chocolate). But how is Divine Chocolate, unlike Hershey’s, not being exploitative if they are using mass marketing strategies in the form of women’s empowerment campaigns to sell their product? The difference here is that Divine Chocolate is actually doing what they say and promote in terms of their campaign to sell product. The women’s empowerment campaign is real because it is empowering women in ways that they have never been empowered before. For instance, Divine Chocolate started their journey to change conditions when they gave 44 percent equity to Kuapa Kokoo, the largest shareholder of the company’s assets; this co-operative represents 85,000 farm members across 1,257 villages, and is now the largest co-operative in the world; it is credited with the rise of female cacao ownership of at least 20 percent (Leissle, Wiego). Divine allows women farmers to take a special part in an ownership that no other chocolate company has seen before; clearly, it is empowering women in a way that not only represents them as true stakeholders, but brings positivism to an industry that can be quit laborious, abusive, and depressing for other workers who are not afforded such basic rights. Further, approximately 2 percent of the turnover from Divine is specifically used to promote programs to help farmers gain more skills such as good governance programs, literacy programs, and model farming lessons. Thus, Divine not only gives more than fair equity to its workers (the largest of its kind in history), but invests even more money from their profit to ensure that their workers are gaining life skills to use both inside and outside the farm; by bringing in educational and quality of life programs, Divine is sending an authentic message with real action to the female farmers of Ghana: Divine wants to support you and your work by uplifting you and the community. Many critics may charge that because the woman is attractive, dressed nicely, and looks happy, Divine Chocolate is exploiting its female workers because it promotes “sexuality” and an “untrue side of the chocolate industry”. However, this picture of the woman is an accurate picture because Divine Chocolate helps uplift women to give them the lifestyle that can afford many of these luxuries; with their fair payouts and fair trade program, Divine Chocolate can accurately use this advertisement as an authentic way to attract consumers. When looking at this advertisement, most consumers, on first glance, would think of Divine Chocolate as a chocolate brand that is an “equality treat” – because it is. They further humanize the female chocolate worker, who is actually a co-operative co-owner, by putting her name on the advertisement; the consumer will be led to think that when they buy a bag or piece of Divine Chocolate, the benefit will be going to female workers like Beatrice – and rightfully so because it actually is doing that. That, in itself, is not exploitation but a smart marketing scheme that is a “win-win” for both Divine Chocolate and female workers like Beatrice. All in all, Divine Chocolate has gone out of their way to make this picture a reality – their own values-based version of the chocolate industry. In their designs, Divine Chocolate presents itself as a champion for women by placing designs that are aesthetically pleasing to many females and placing a message on top of the packaging reading “Empowering Women Cacao Farmers.” Like in the picture above, some critics may think that by putting this packaging out in this manner, Divine Chocolate is exploiting women workers because they are using designs that attract consumers to think that they are helping women workers. However, like stated in the previous discussion, they actually are helping women. Further critics may charge that this is being used for International Women’s Day to “cash in” on the holiday, but that charge only further hones in on the point that Divine Chocolate is not being a champion of women just on Women’s Day but essentially every day. Just because a company uses an element of their system (which, in this case, is championing the female worker) to sell product does not mean that they are being exploitative. On the other hand, if Divine Chocolate was using the same business practices as Hershey’s and using this campaign, they would then be exploitative. But Divine Chocolate is simply promoting the ideas and concepts that they have actually put into practice. Litmus Test: Is Divine Chocolate partaking in any of the following? Clearly, unlike Hershey’s, Divine Chocolate does not pass the litmus test for exploitation; the Women’s Empowerment Campaign is a real campaign, which Divine Chocolate uses for smart marketing and true empowerment. Alberts, Heike. “Using Cocoa and Chocolate to Teach Human Geography.” Journal of Geography, 2010. Binkley, Sam. “Cultural Studies and Anti-Consumerism.” New York: Routledge, 2011. Print. Leissle, Kristie. “Cosmopolitan cocoa farmers: refashioning Africa in Divine Chocolate Advertisements.” Journal of African Studies, 2012. Preston, Julia. “Pleas Unheeded as Student’s U.S. Jobs Soured.” New York Times, 2011. It is not a secret to those who know me well that I love chocolate. I specially enjoy super dark, extremely bitter (70-90%) Cacao bars. I also like—the unfortunately less nutritious—white chocolate products. I regularly buy white chocolate bars or bon bons from local grocery stores. Yet, my finest inclinations—as a chocolate taster—are always in favor of the darkest, unsweetened, highly concentrated cacao bars. According to content learned in Harvard University professor Carla D. Martin’s class Chocolate, Culture, and the Politics of Food, I am a hypertaster or someone who has “more papillae that are very closely arranged and smaller” (Martin, 13). This can make me an unreliable taster, and it probably explains my experience with tasting food—I always sound either very excited or really disgusted about flavors in contrast to most of my friends, who seem balanced in their perception of taste. Regardless of the odds, I continue to be their main “adviser” on good local restaurants. This is probably due to my “passionate” approach, which grabs their interest. I regularly walk to a nearby Walgreens drugstore to get my prescriptions (see fig. 1 and fig. 2). It was not until joining professor Martin’s class that I paid attention to their chocolate section. It actually happened around Valentine’s, when most of us (particularly females) are targeted with advertisements and offers of candy and chocolates. Very curious—recalling our class’ discussions—I explored these isles at the store and I found—not surprisingly—an “avalanche” of well known chocolate brands (like Lindt, Cadbury, Nestle) lying next to the candy section (see fig. 4). Fig. 1. Walgreens drugstore at Vermont Avenue and 6th Street, Los Angeles, California. Fig. 2. Pinned location of Walgreens at Vermont Avenue and 6th Street, Los Angeles, California. Walgreens was founded in 1901 by Charles R. Walgreens in Dixon, Illinois. He started Walgreens as a “50 feet by 20 feet” (“Our Story”) drugstore, which later developed into a giant chain of pharmacies, and successfully expanded across the United States. 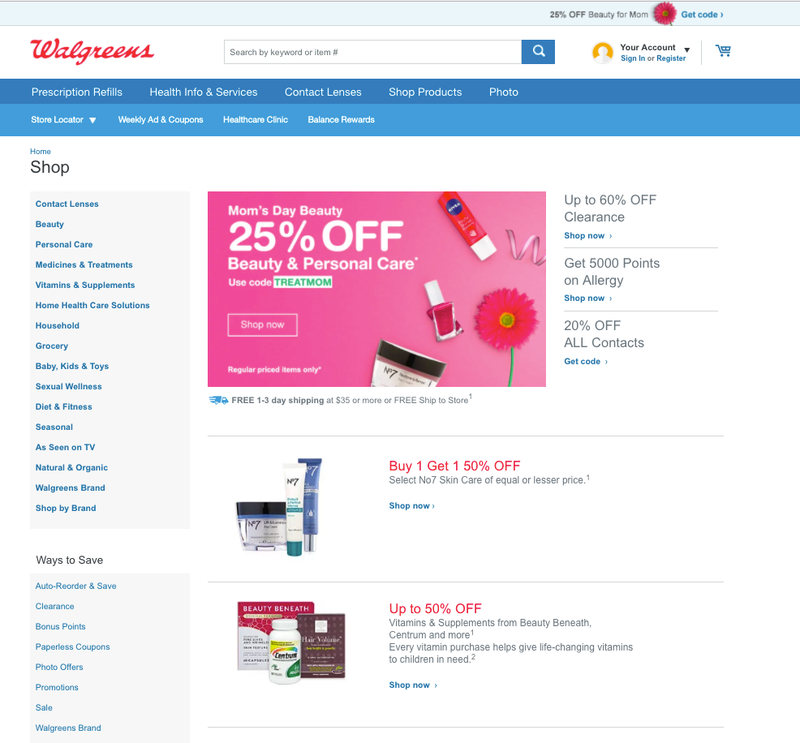 In the Walgreens website, its motto reads, “A history of our company: How a neighborhood drugstore became America’s most trusted pharmacy… and changed the shopping habits of a nation” (“Our Story”) . That seems consistent with the Walgreens of today, which steadily renovates its inventory to offer beauty, household and even grocery products (see fig. 3). Fig. 3. Walgreens’ online shopping portal. So, who goes to Walgreens for chocolates? Is it just me? Highly doubtful! I visit the store at least once per month. Since last Valentine’s their chocolate supply was re-stocked. I was shocked to see some of the brands that professor Martin reviewed in class (i.e. Endangered Species Chocolate) at my local Walgreens. Their wide list of product categories, makes Walgreens a good candidate for casual grocery and retail shopping. And when it comes to chocolate and candies, I am not alone. The day that I chose to take pictures for this assignment, I had to move aside several times to let other shoppers shop, and to let their children run wild over the candy section. It is perhaps its versatility—as business scholar Katy Mullis suggests in her paper A SWOT Analysis of Walgreens in the Competitive Pharmacy Marketplace—what keeps the retailer thriving. Mullis describes the advantage of their extensive product selection, “The company strives to offer a merchandise mix in line with this focus, providing customers with one-stop stopping for not only prescription drugs, 6 but also over-the-counter-drugs, health care products, grocery selections, gifts, holiday and seasonal items, and one-hour photo developing” (Mullis, 5-6). Walgreens—based on Mullis’ work—holds strongly as a convenience market. People go there to order prescriptions, and spend no less than fifteen minutes waiting for them to be ready. This gives the company a tremendous advantage to sell more than just pharmaceutical goods. I personally buy candles and incense at Walgreens since 2015—and now, I additionally buy their chocolates and wine. Although Walgreens sells a great variety of chocolates, it is not a specialty shop for cacao products. It conveniently stocks brands that are popular and generally available in other food markets. Therefore, I was not expecting to find fancy delicacies there—and none else should. It would be an exception from their purchasing habits if it ever happened. 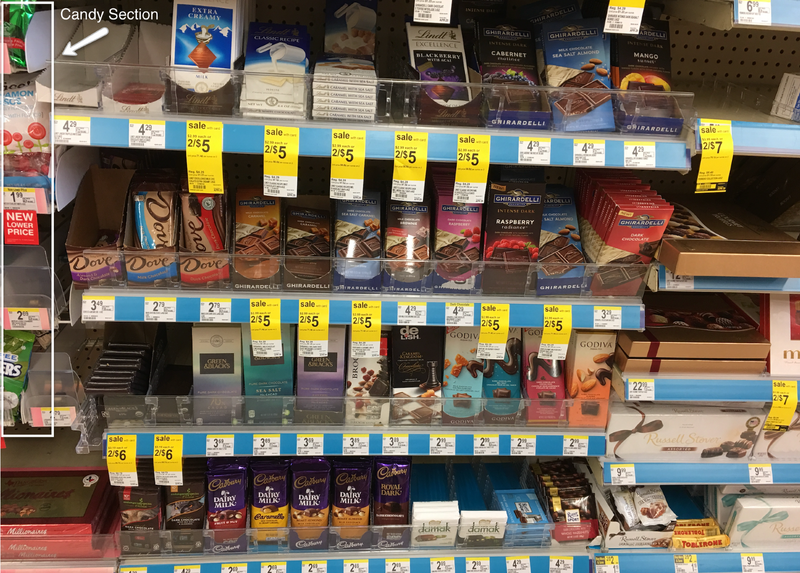 Nevertheless, their chocolate selection is sufficiently versatile—considering that Walgreens is primarily a pharmacy, and not a grocery chain like Ralphs or Gelson’s. Fig. 4. Walgreens’ “Chocolate-Candy” section at a Walgreens store in Los Angeles, California. The chocolate bars sold at Walgreens range from low to very good quality—as far as branding and taste. Some of their prevalent brands were mentioned at professor Martin’s class: Hershey’s, Cadbury’s, Nestle, Lindt, etc. It is uncommon to see organic products there (I did not find any at all), or certified products in general. But sometimes random supplies make it to their shelves and one stumbles upon a deliciously crafted chocolate bar. With this research in mind, I selected and purchased a few items that attracted me. Recalling the chocolate tasting activities performed by professor Martin, I bought two of the Endangered Species Chocolate brand. I also picked the Chili and White Coconut—of course—bars from Lindt and a few others, nicely appealing (presentation-wise and content-wise). Notwithstanding, I avoid Hershey’s and Cadbury’s almost all the time. I feel that they make products that are so sweet and “distressed” that I am unable to taste any real chocolate in them. My “repertoire” consisted of the items shown below (see fig. 5). Fig. 5. Chocolate Tasting Selection. 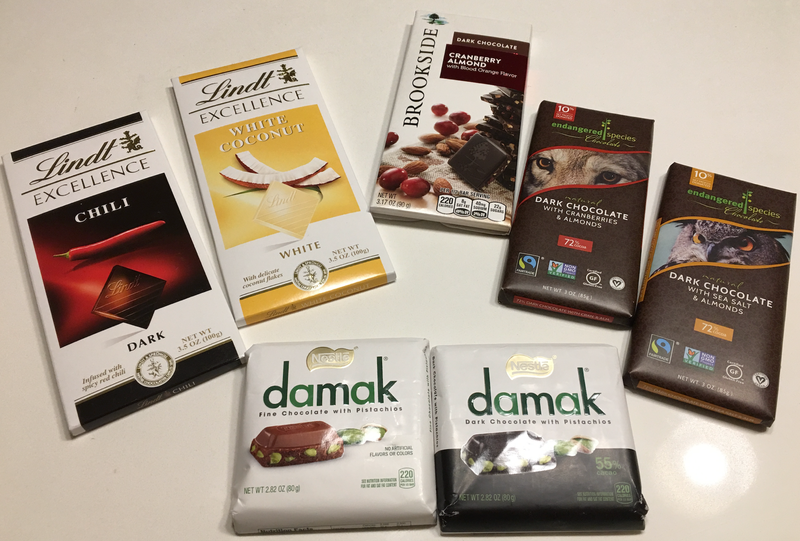 1 Damak Fine Chocolate with Pistachios bar by Nestle, $2.89 / 2.80 oz. 1 Damak Dark Chocolate with Pistachios bar by Nestle, $2.89 / 2.80 oz. 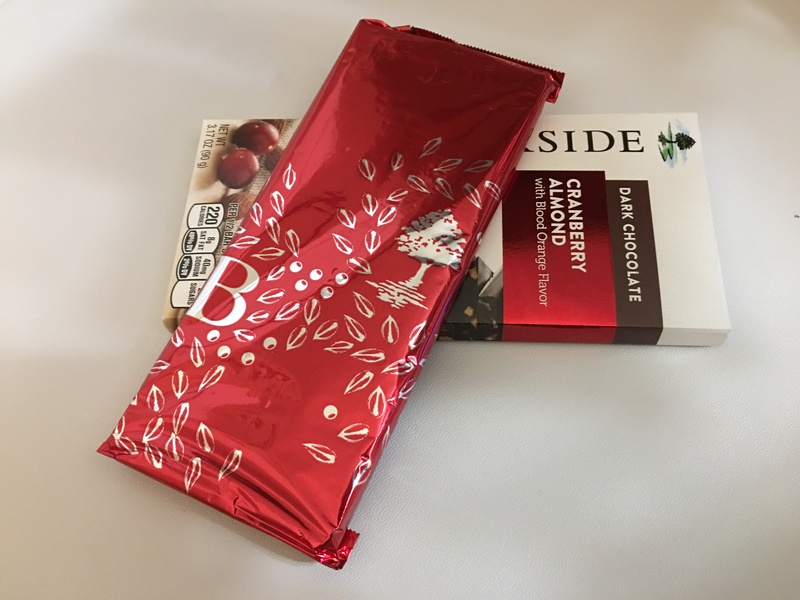 1 Dark Chocolate Cranberry Almond with Blood Orange Flavor bar by Brookside, $3.89 / 3.17 oz. 1 Dark Chocolate With Sea Salt & Almonds bar by Endangered Species Chocolate, $4.29 / 3 oz. 1 Dark Chocolate With Cranberries & Almonds bar by Endangered Species Chocolate, $4.29 / 3 oz. 1 Excellence Chili Dark Chocolate bar by Lindt, $2.50 / 3.50 oz. 1 Excellence White Coconut White Chocolate bar by Lindt, $2.50 / 3.50 oz. Fig. 6. 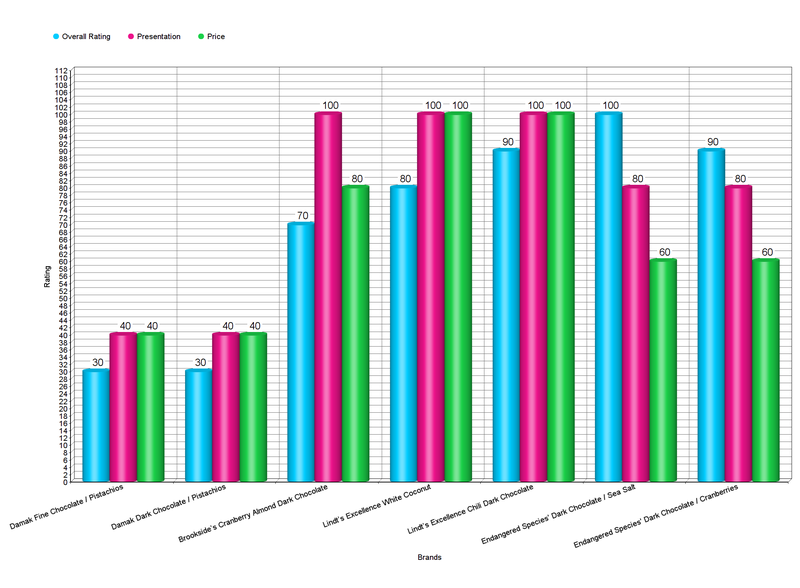 Measuring Chocolate Tasting Results. The tastiest bar: Endangered Species Chocolate’s Dark Chocolate With Sea Salt & Almonds. The best deal: Lindt’s Chili Dark Chocolate. The worst product: Nestle’s Damak Dark Chocolate with Pistachios. The worst tasting experience corresponds to Nestle’s Damak series. Professor Martin remarked during her lectures about processing chocolate, that over-conching can result in a “flat, lifeless” (Martin, 56) and dull product—which was evident when tasting the Damak series. In regards to Brookside’s Cranberry Almond Dark Chocolate with Blood Orange Flavor, I was dazzled by its fancy name and its presentation. Beautifully enclosed in a delicate foil envelope, it featured sketches of almonds, cranberries and an orange tree etched in silver color over a dark red background (see fig. 7). Whereas its base cacao mix did not feel over-conched or poorly processed, the presence of so many strong flavors (orange, almonds, cranberries) created an ambiguous taste that did not impress my palate, so I classified it as too busy. Decidedly, my preferred choice became the Endangered Species’ Dark Chocolate With Sea Salt & Almonds. It has a sharp, lively, delicious chocolate presence along with salty, crispy notes of sea salt and almond chunks. The only downside of this brand is that it is pricey—looking at the cost and its net weight. However, all of its certifications and its quality make it seem worth the investment. Regardless, certifications should be interpreted with caution—according to professor Martin’s research titled The Bitter and Sweet of Chocolate in Europe, co-authored with Kathryn E. Sampeck—because often they result in misguided efforts that do not really support cacao farmers as they claim to, and that benefit primarily “wealthy consumers” (Martin and Sampeck, 52) frequently halting “innovation by prioritizing consensus among participating companies and incentivizing only baseline standards adherence, ultimately becoming part of the problem” (Martin and Sampeck, 52). The problem—in this case—refers to the ever-growing poverty in many cacao-producing nations, and in the difficulties experienced by cacao farmers to sell their raw materials and to collect their earnings afterwards, whether they participate or not in certification programs. Fig. 7. Brookside’s Refined Cranberry Almond With Blood Orange Bar. In the next section are the details about the ratings from the chocolate tasting experiment. A curious detail revealed by the experiment, was the ubiquity of packaging certifications. Almost every chocolate product at Walgreen’s shelves displayed one or more packaging certification logos—even when the product itself was not certified. This proves that consumers are not only interested in eating well: they are also concerned about the impact that the products they consume have in the environment. Hopefully, consumers will succeed in voicing their interest to chocolate manufactures and cause them to buy more certified raw materials, and to support standardized certification programs. Shopping at Walgreens for chocolates was quite an experience. If it was not because of taking professor Martin’s class, it would have likely skipped it. Yet, her class succeeded in making me a more conscious food shopper. I feel now compelled to read food labels and to check for certifications, which—other than USDA Organic—sounded irrelevant to me before enrolling in Chocolate, Culture and the Politics of Food. Understanding the difference between Fair Trade, USDA Organic and other classifications does make a difference in the “wholesomeness” and perception of a product. I am specially keen about the complex chain of connections that begins at a chocolate farm and ends on the hands of the consumer. I “pledge” to use more discernment in my future purchases by supporting transparent, environmentally and socially conscious chocolatiers. What Kawash suggests has been historically documented and marked by the evolution of the advertisement and media. Today’s most renown chocolate brands in America (i.e. Hershey’s) produce hyper-processed, hyper-sweetened chocolate goods. There is almost no difference between eating these chocolates and eating pure candy. But there is new is hope for a positive change that arises from consumer awareness. We—as consumers—can and are transforming the current food market. The dangers of sugar addiction and chemical processing are being exposed, and food shoppers are turning to natural alternatives. We are all hopeful about the rise of healthier and tastier food (and chocolate) that—most definitely—will lay in the hands of our millennials! *Disclaimer: This essay is drawn from a personal experience. Therefore, it is written in First-Person. Faith, Arleena. Brookside’s Refined Cranberry Almond With Blood Orange Bar. 2017. Digital photograph. Los Angeles, California. Faith, Arleena. Packaging Certifications. 2017. Digital collage. Los Angeles, California. Faith, Arleena. Product Certifications. 2017. Digital collage. Los Angeles, California. 2013, New York, Print. Apr. 2017. Europe.” Harvard University, Cambridge, Massachusetts. 2015. Print. 2017 May 2. Company. 2017. Web. 2017 April 28. Maps. 2017. Web. 2017 April 28. Walgreens. 2017. Photograph. Google Maps. Google, Inc. Web. 2017 April 28. The average individual living in the United States encounters over 3,000 advertisements each day. Over the span of our lives, we will spend two years watching television commercials for various services, products and more (Kilbourne 2015). While the success of these advertisement campaigns varies, and is definitely subject to much discussion, it is clear that the chocolate industry has been tremendously successful in promoting its various products. In fact, chocolate has become such a desirable treat that there has even been a term coined for one who consumes significant amounts of chocolate, a “chocoholic.” However, these advertising campaigns are coming at an undeniable price. How do advertisements in general affect our public opinions, specifically surrounding issues pertaining to body image? Could it be that the prevalence of chocolate advertisements in our society may be having a negative impact on our body ideals? If so, to what extent? By closely examining research on the connection between media and eating disorders as well as analyzing a number of prevalent chocolate-related advertisements, it will become clear that the body ideals that we are creating as a society are inherently harmful and that these ideals are directly connected to the advertisements that we are exposed to on a daily basis. In order to understand how chocolate advertisements have negatively affected our societal body image, it is important to first understand what the societal standards for beauty are at the moment. Body image is defined as, “the physical and cognitive representation of the body which includes values about how we should look along many dimensions (age, size, height, color, attractiveness, etc,)” (Jade). This definition is interesting because the focus is placed on perception, not on reality. For example, very frequently individuals who are at their ideal body weight and BMI for their height and age feel like they must gain or lose weight based on societal body standards. Body image is not rooted in science or health; it is purely determined by our media. “Body types, like clothing styles, go in and out of fashion, and are promoted by advertising,” (Kilbourne 2015). This further supports the fact that body ideals are completely arbitrary. Unfortunately, there exists a destructive paradox between ideal body image and food advertisement. We are often shown photographs of attractive, skinny, toned men and women eating fast food like McDonald’s or Burger King or Sonic. Although this paradox exists for both men and women, chocolate advertisements are generally focused towards women, so for the purpose of this analysis, we will focus mainly on women. There exists a significant gap between what we view as “beauty” and what is achievable for the average individual. As a matter of fact, only 5% of women who are considered to be healthy are able to even achieve the societal ideal that the media has created (Kilbourne 2015). What is even more frightening is that this number is consistently decreasing, leading more than 95% of females to chase an ideal that is completely impossible for them to reach. Because the ideal is unattainable, this creates a society in which women are conditioned to hate their bodies no matter what. The fact that women are bombarded with constant reminders of what they “should” look like but are not able to achieve this leads to a decrease in self-esteem. This feeling of helplessness has led to an increase in the diagnosis of Bulimia Nervosa, an eating disorder in which individuals engage in a cycle of binging and purging in an attempt to manage their weight (Jade). With a strong understanding of the prominence of body image issues in today’s society, we can now delve a bit more into how advertisements, specifically chocolate marketing, have led to these problematic body ideals. Advertising often can have the effect of “’normalizing’ values or behaviors” of the broader society (Make Wealth History). This is interesting because many people would assume that marketing would simply reflect our current values and societal mood rather than set it as this article asserts. One question that arises is how marketing can have such a tremendous impact on the way we view the world? How can a few well-placed ads completely change societal ideals? The answer is that it is not really a few well-placed advertisements; advertising is a multibillion-dollar market. Given that food accounts for only 12.5% of all purchases, it would stand to reason that it would not be a significant advertiser (Story and French 2004). However, the food industry is the second largest advertiser in all of consumer goods (Story and French 2004). In fact, over half of the commercials in any given hour of television programming are designated to food products (Story and French 2004). Of the average food company budget, upwards of 75% is designated specifically to advertising and marketing (Story and French 2004). This is an obscene number. Many would assume that the vast majority of these budgets would be devoted to the actual development and production of quality goods, but this is clearly not the case. The important thing to remember is that at the end of the day, the food industry is a business and they are ultimately out to increase their profit through any means necessary. Companies have two responsibilities: one to their consumers to produce beneficial, enjoyable products and one to their shareholders to maximize profits. Unfortunately, the former will almost always take a backseat to the latter. One way that companies do this is by creating advertisements that highlight personal insecurities and inadequacies; the aim is to make consumers believe the product is important or that it will better their lives in some way, compensating for something they lack. For example, if a marketing campaign includes a model with a perfect smile, we may associate the advertised product with a great smile regardless of whether or not there is any actual connection between the product and our smiles. While companies may claim that their advertisements have no negative impacts, this is not the case. We are exposed to these images on such a constant basis that they have significant influence over our priorities as a society. Although this is an unfortunate reality, the advertisers have no reason to change because as long as these campaigns are creating demand, they will continue to employ them no matter how problematic the societal consequences. Having discussed the implications of advertising campaigns and marketing on our cultural psyche, we can now analyze a few chocolate advertisements and how they negatively impact societal body ideals. Because most chocolate advertisements are targeted at the female-identifying population, we will focus mainly on those such marketing campaigns. However, for good measure, we will include one male implied advertisement. In this advertisement, a few things pop out immediately. First of all, the viewer is meant to notice the extravagant curves of the model; the round shape of her buttocks, the side of her breasts peeking out. You can quite literally see the curves in her body. Additionally, it is interesting to note that you can also see her angel bones very prominently as well as the small of her back. These are all signs of skinniness, a modern desirable characteristic among both men and women. Also, there appears to be an almost natural shine to her skin as well. Finally, notice that the consumer cannot see the model’s face. Because you cannot see what she looks like, this advertisement seems to be subtly suggesting that you too could look like this woman. Since she is quite literally made of chocolate, the psychological implication is that eating chocolate can lead to this type of physique. This advertisement is somewhat less explicit with its body image narrative, although it is most definitely still present. For one, look at the incredibly defined cheekbones of the model. This is something that is very desirable among females under today’s body ideals. Additionally, she has very slender, long fingers. Her lips are thin as well. All of this is indicative of the ever-present “thin ideal.” Additionally, her appearance is nearly flawless. This conveys the idea that chocolate allows women to achieve this impossible perfection or that women who are “perfect” eat chocolate. The advertisement works mainly through connections, much subtler than the first advertisement. The fourth and final advertisement seems to vary greatly from the first three for obvious reasons: the model is a male. In this advertisement, the consumer can see the torso of a man with incredibly defined abdominal muscles. The body ideal for men is often seen as muscular, tall, and lean. This man embodies all of those characteristics. If you look at the tagline of this advertisement, it says “six packs melt a girl’s heart. Dove Chocolate.” This carries a few implications. First of all, the direct one is that since Dove is marketing a six-pack of chocolate, that the chocolate is quite desirable to women. However, this is clearly not the main focus. While the previous three advertisements can negatively impact female body image, this one is incredibly problematic for men. It insinuates that a “six pack” or defined stomach muscles are the key to any woman’s heart. Even further, it can be taken to imply that without them, it could prove difficult to find a significant other. Because abdominal muscle definition is based almost entirely on genetics and body composition, two things over which we as humans have no control, this image enforces very unhealthy body image ideals among men. Throughout all four advertisements, there is one common idea: there is an inherent connection between chocolate and looking this good and being fit. The implication that there is any connection between chocolate and toned abs or defined cheekbones is ludicrous, and yet that is what we are being told subliminally. This perfectly demonstrates the problem with these chocolate advertisements and marketing campaign in general: they only provide a glimpse of an individual or a product. Advertisements are meant to show thirty seconds of an ideal life—a snapshot—but our lives are not isolated to thirty-second frames. We are bombarded with perfect individuals to whom we are forced to compare ourselves. But this is not a level playing field. We are essentially comparing their highlights to our behind the scenes work. We see their perfect figures and bulging muscles and assume that if we work hard enough, we can achieve those as well. However, as mentioned earlier, a vast majority of individuals are not physically able to reach the “body ideal” at all which makes enforcing it all the more dangerous. Although modern advertising is incredibly problematic, there is a very easy fix: instead of selling bodies, stick to selling products. The focus of advertising campaigns does not have to be the individual who is representing the product. In order to demonstrate this point, observe this fantastic Cadbury advertisement. This chocolate looks absolutely delectable! It is so smooth that the light reflects off of its surface, the caramel dripping out of the hollow center. As a consumer, I would argue that this image presents the product as markedly appealing than any of the other advertisements seen above. Granted, the subliminal lifestyles that are implicated by the other four images are subconsciously appealing, but given their overwhelmingly negative societal impacts, it is more important for companies to focus on products, not people. Chocolate companies cannot be blamed for creating these problematic body ideals, but they definitely are guilty of propagating them. By running marketing campaigns that include images such as the ones analyzed in this post, they feed on our deeply-seeded body insecurities. The more people see these images, the more desperate they become to look like the models, sometimes engaging in disordered eating because they believe that to be the only way that they can achieve these impossible body standards. By analyzing multiple chocolate advertising campaigns in conjunction with research on the prevalence of eating disorders in modern society, it becomes clear that there is an undeniable causal relationship. In fact, according to the National Eating Disorder Association, “Numerous correlational and experimental studies have linked exposure to the thin ideal in mass media to body dissatisfaction, internalization of the thin ideal, and disordered eating among women,” (National Eating Disorder Association). 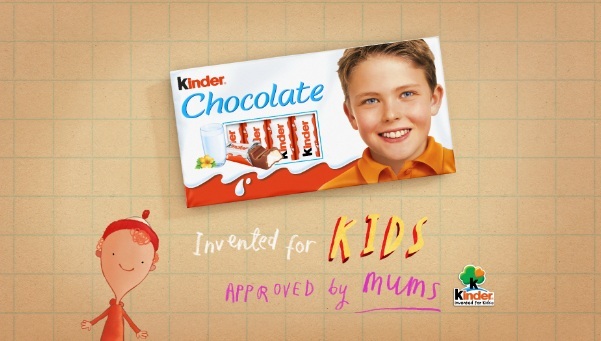 Although chocolate companies are not solely responsible for propagating these ideas, they are often some of the most egregious offenders of such imagery. It is very seldom, if ever, that you will see a chocolate advertisement with a model who does not adhere to the thin ideal. However, if chocolate companies, and advertisers in general, were to focus less on the models and more on the products they are promoting, our society may begin to stray from these destructive beauty standards and allow people to forge healthy relationships with their bodies, and ultimately, themselves. Kilbourne, Jean. “Advertising’s Toxic Effect on Eating and Body Image.” Harvard School of Public Health. (March 18, 2015). Retrieved from https://www.hsph.harvard.edu/news/features/advertisings-toxic-effect-on-eating-and-body-image/. Jade, Deanne. “The Media and Eating Disorders.” National Centre for Eating Disorders. Retrieved from http://eating-disorders.org.uk/information/the-media-eating-disorders/. “The Cultural Impact of Advertising.” Make Wealth History. Retrieved from https://makewealthhistory.org/2011/10/26/the-trouble-with-advertising-2/. Story, Mary and French, Simone. “Food Advertising and Marketing Directed at Children and Adolescents.” National Center for Biotechnology Information. (February 10, 2004). Retrieved from https://www.ncbi.nlm.nih.gov/pmc/articles/PMC416565/. “Media, Body Image and Eating Disorders.” National Eating Disorder Association. Retrieved from https://www.nationaleatingdisorders.org/media-body-image-and-eating-disorders. You may be surprised to find out that the chocolate that we know today is a relatively new, tasty discovery- one that came about from the Industrial Age. 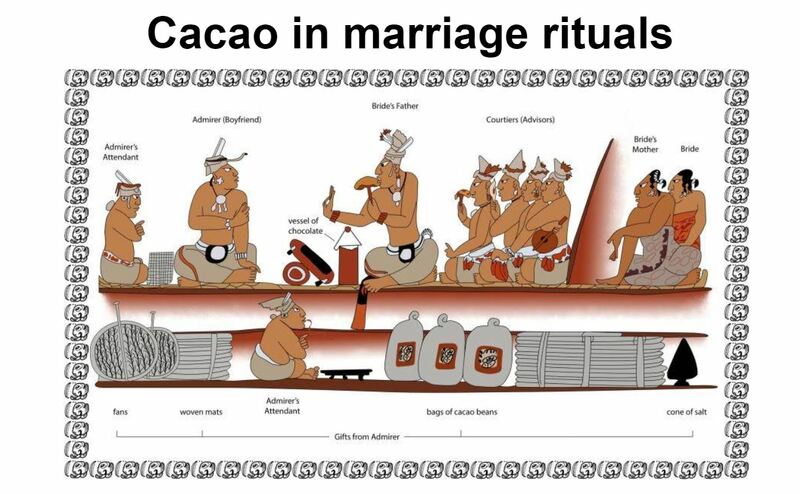 Cacao was considered the “food of the gods,” and was treated as such: before the Industrial Age, chocolate was made the traditional way that the Mayans made it with a long, drawn-out process of cracking shells and traditional grinding to create a bitter chocolate drink (unlike the chocolate of today) (Szogyi, 1997). This treat was considered to be a drink that was both a commodity and spiritual experience; although it was available to the masses, the wealthy certainly had more access to the treat because they could afford it. Cacao was taken as such a serious product that the Mayans used its seeds as currency; further, it was used to promote fertility and life, and cacao pods are found all over elite and ancient artifacts, temples, and palaces. Clearly, these uses and techniques demonstrate how luxurious chocolate was to them; these processes stayed this way even during the era of the Aztec empire and many centuries later (Horn, 2016 & Szogyi). This process of chocolate was so revered that it essentially did not change until the Industrial Age with a ground-breaking invention for grinding that used the newly-innovated steam and hydraulic process; in 1778, Doret, a Frenchman, invented a hydraulic machine that grinds cocoa beans into a paste (Beckett, Horn). Before then, the process of grinding was long and tedious and this machine allowed the process to become easier to create for the masses. Soon after, more inventions came along for grinding that further made consumption more popular. 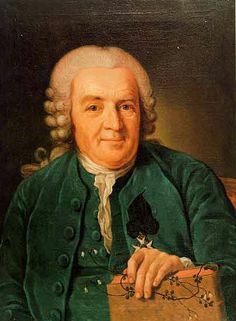 For instance, Dubuisson invented a steam chocolate grinder in France because it was even cheaper to replicate than Doret’s product, which allowed for an even higher level of mass consumption of chocolate. The Industrial Age created the environment to allow for this change – without steam and hydraulics, and the friendly and booming business atmosphere for support, Doret and Dubuisson would certainly not have been able to create these inventions. Where would be chocolate be today? One could reasonably predict that we could have eventually have had these technologies, but it is safe to assume that it would have taken the chocolate industry much longer to reach its glory. The steam engine and hydraulic system are considered staples of this Industrial Age with new technologies across the boards for trains, factories, and buildings, but we can also appreciate how these technologies allowed for the advancement of chocolate technology. The value of chocolate significantly decreased because it was accessible to everyone; from here on, it was no longer an “elite” product or just a “food of the gods,” but, rather, a food for everyone. Thus, the Industrial Age that changed the world on so many fronts quickly churned into the “Chocolate Age” as well. The idea of the mass consumption of chocolate from the Industrial Age can be traced along the later part of the history of chocolate. Quickly after the revelation with the cocoa beans came a new way to make chocolate an even more accessible product with commercialization – via “dutching” (Squiciarinni & Swinnen, 2016). In 1828, Van Houten, a Dutch chemist, invented a method to press cocoa by separating the cocoa butter by pressing it with alkali, making the matter soften up enough to produce cocoa powder, which was light and fluffy; unlike the current chocolate of that time, dutching made chocolate highly digestible, which would attract new consumers and open up a whole new market for chocolate – just like these technologies helped do so in other industries such as the construction field (i.e. making materials more affordable and attractive for building). Additionally, cocoa powder was the secret ingredient needed for the chocolate industry and companies to seamlessly make solid chocolate bars and coat them as well as bring in new flavors such as white chocolate. From there, a second wave of the Chocolate Age had been set and was about to take place. With the mass consumption of chocolate from these new Industrial technologies came mass commercialization. Quite simply, we can see that chocolate companies would not be what they are today without this commercial influence; specifically, the dutching process sparked a spread of commercialization across Europe, which allowed for the worldwide chocolate industry we have come to know and love. For example, Cadbury, one of the largest chocolate companies today, and Joseph Fry (founder of what is known as Mondolez International today) bought the dutching press; these two companies are credited to be the first companies to create and sell the chocolate bar. They also made the chocolate bar a highly accessible treat with aggressive advertising; this marketing scheme raked in millions of dollars for these companies (Beckett, Horn). It was the catalyst behind the beginning of giant factories built to keep up with this demand. Thus, the chocolate bar became (and still is) a symbol for a quick, delicious treat for everyone and anyone. Moreover, the dutching system then inspired the chocolate exportation business that brought chocolate on to an international stage – a few decades after the start of the chocolate bar, the Van Houten presses became powered by steam engines, and, just like with the Dubuisson’s steam engine, came with another Chocolate Revolution. The mass consumption and commercialization of chocolate began in European countries such as Germany and France, which eventually led its way to the United States (Beckett, Szogyi). These countries then started their own chocolate giants such as Hershey’s and Nestlé, which embody the same mass consumption and commercialization ideals that have advanced the history of chocolate along and allowed it to further churn. Without the Industrial age, chocolate would just not be the same. It is literally unrecognizable from its Olmec and Mayan roots. From the Industrial Age, the Chocolate Age churned on and on – all starting with the advancements in steam and hydraulics. Beckett, S.T, et al. Industrial Chocolate – Manufacture and Use. Wiley Publishers: Hoboken. Horn, Jeff. The Industrial Revolution: History, Documents, and Key Questions. (2016). ABC-CLIO: Santa Barbara. Squicciarini, Mara P & Swinnen, Johan. (2016). The Economics of Chocolate. Oxford University Press: Oxford. Szogyi, Alex. (1997). Chocolate: Food of the Gods. Greenwood Publishing Group: Westport. Throughout its history, chocolate has maintained a relatively stable existence in terms of its functions and production. While there have been periods of change, there have also been long stretches of time where chocolate use stayed consistent. 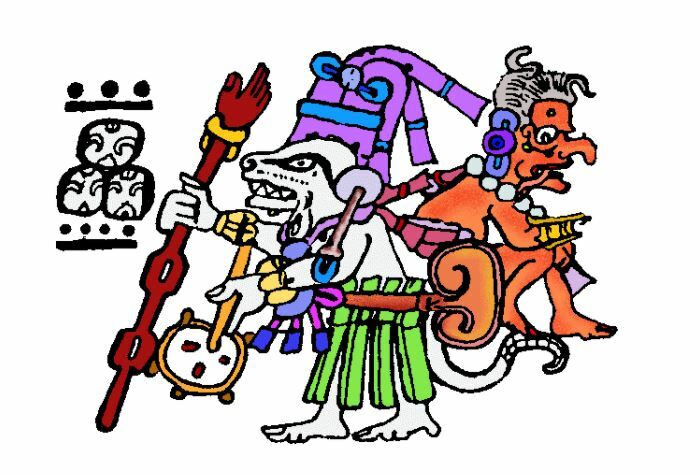 For example, in Mesoamerica from as early as 1800 BCE to as late as 900 CE chocolate was consumed as a beverage and used in a variety of religious ceremonies (C-Spot). However, when brought to Europe in the early 1500s, chocolate went through a period of rapid change. Most significantly, chocolate’s industrialization led to a change in its accessibility, highlighting how advancements in production methodology and advertising of chocolate altered its social standing and class function. Through careful examination of key events in the industrial timeline of chocolate, four stages can be identified that each show a transition in the industrial development, ultimately linked to societal structure and function. Starting in the 16th and 17th centuries, chocolate was introduced to Europe as a drink for the aristocracy. Over these two centuries, chocolate served a variety of functions, of which some are no longer recognized in modern society. In 1556, the earliest recipe for chocolate was documented in Spain. This recipe, collected by a lieutenant of Captain Hernán Cortés, relates how the cacao beans are ground into powder, mixed with water until foamy, and then stirred with gold or silver spoons until drunk. This was an especially common recipe in Mesoamerica. The entry then declares that this drink is the “most wholesome and substantial of any food or beverage in the world…whoever drinks a cup of this liquor can go thru a whole day without taking anything else even if on a cross country journey” (C-Spot). This account clearly relates cacao’s function as a hearty beverage with a substantial amount of nutritional value. However, the function of cacao changes in the 1580s when it contributes to the humoral theory of medicine in that its “hot” nature combats poison, alleviates intestinal discomfort, and cures a variety of other ailments (Coe 122). 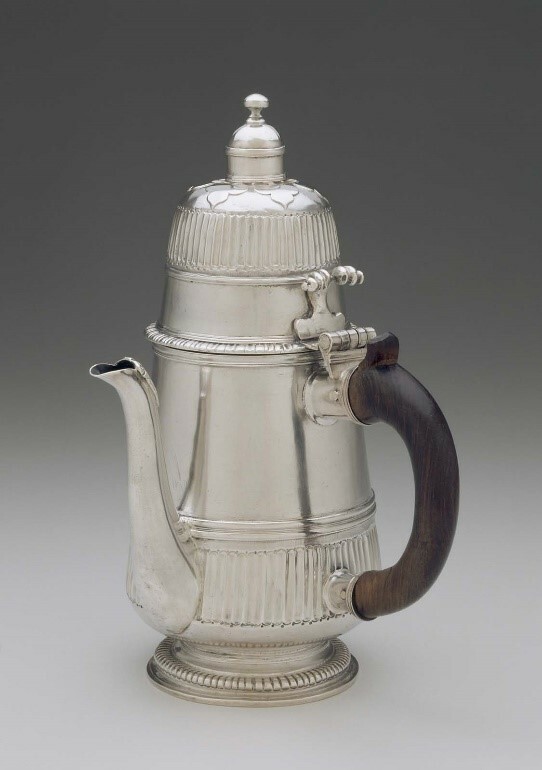 This functional form sticks with chocolate into the 1600s where its increasing demand eventually leads to European plantations in the Caribbean that operate to ensure a steady supply of cacao for the European elite. In fact, the elite were so floored by chocolate that in 1657 the first chocolate house was established in London (C-Spot). These houses were the cultural and political hub for society’s elite (Coe 223). To get a historical and social sense of a chocolate house in England, this article by Dr. Matthew Green published in The Telegraph is quite informative. Dr. Green does a great job of capturing the sophisticated nature of these houses, particularly those of the super elite on St. James Square. In the 16th and 17th centuries, chocolate was served to the elites of Europe in a variety of functions ranging from a medicine to a simple, yet powerful, beverage. However, as the 18th and 19th centuries approached, a more transitional period of chocolate began to take form, in which production was industrialized and the final product was made more accessible to the middle class. Starting in 1764, the first power machinery was used in chocolate production, in the form of a grist mill, used to grind cacao beans by Baker’s Chocolate in Dorchester, Massachusetts (Coe 227). Baker’s Chocolate was founded on the pillars of purity of product, mass production, money-back guarantee, and affordability (C-Spot). These pillars emphasize the shift from the chocolate drink as an item of the elite to a mass produced and advertised product accessible to a range of social classes. This evolution of chocolate manufacturing continued in 1828 when Coenraad Johannes van Houten received a patent for his screw press, used to separate fat from the roasted cacao beans (C-Spot). This method was an inexpensive way of removing fat and leaving behind a cake that could be ground into a fine powder (C-Spot). Later call the Dutch Process, it was promoted by van Houten as “for the rich and poor – made instantly – easier than tea” (C-Spot). It was even thought of as a more suitable chocolate for women and children as this process removed the bitterness found in untreated cacao (C-Spot). The last industrial innovation of note was the first mass-marketed chocolate bar produced by Fry’s Chocolate. In 1847, Francis and Joseph Fry were able to perfect the chocolate mixture in a moldable form, thus forming the first bar (Coe 241). As can be seen in the advertisement below, Fry’s Chocolate consumption was directed at children due to its sweeter taste, and thus more accessible when compared to the 16th and 17th centuries. and obtainable chocolate for all social classes. There are a few events deserving specific attention as they highlight the theme of chocolate industrialization and its effects on accessibility, mass marketing, and mass production. For example, in 1875, Daniel Peter and Henri Nestlé created milk chocolate using Nestlé’s powdered milk, creating a sweeter chocolate to be enjoyed by a wider range of people (Coe 247). Other similar advancements include, Rudolph Lindt’s conche machine in 1879, which created a smoother sensory experience and the invention of the Toblerone in 1908 as a different approach to chocolate involving a mold and filling (Coe 247, 248). These developments, along with the introduction of a variety of chocolate products, ushered in an era of mass production and accessibility. and “grocery store” chocolate has arisen due to a change in consumers’ preference for sustainable and fair trade foods. While people occasionally love to get their hands on a Milky Way, many consumers are attracted to the idea of a pure chocolate bar whose ingredients can be traced throughout the entire production process. Over time, the function and accessibility of chocolate has shifted to mirror the industrial aspects of its production. When first introduced to Europe, chocolate was produced in colonialized islands and intended as a drink for the elite, while also serving a purpose in the medical world. In the 18th and 19th centuries, chocolate underwent a transitional period where industrialization was introduced in the form of mass production and advertising, thus making chocolate accessible to all classes. This period was followed by a rapid expansion of the chocolate industry where chocolate was consumed in solid form and constant advancements were made to appeal to the variety of tastes craved by consumers. Finally, today, we still enjoy a variety of mass produced chocolate candies, but now we strive for a bar crafted with sustainability, purity, and fairness in mind. “A CONCISE HISTORY OF CHOCOLATE.” The C-spot. Web. 08 Mar. 2017. Counihan, Carole, and Penny Van Esterik. Food and Culture: A Reader. New York: Routledge, 2013. Print. Green, Dr. Matthew. “The Surprising History of London’s Lost Chocolate Houses.” The Telegraph. Telegraph Media Group, 13 Dec. 2013. Web. 08 Mar. 2017. Martin, Carla D. “Lecture 4: Popular Sweet Tooths and Scandal.” Aframer 199x. CGIS, Cambridge, MA. 22 Feb. 2017. Lecture. As I ponder the selections of chocolate available in my local Trader Joe’s , it is important to understand a bit of the history of chocolate that is included in The True the History of Chocolate by Coe & Coe .Cacao, Chocolate originated in Meso-America and is referred to as the “Food of the Gods” consumed by the elite and used in sacrifices to please the gods. 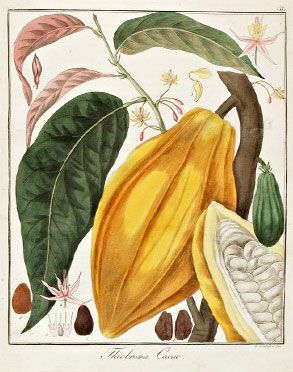 Did you know that unlike money cacao really does grow on the pods and barks of trees.The chocolate trees were scientifically named Theobroma cacao in 1753 by the “great Swedish Naturalist” Linnaeus (1707-78). Raw Cacao beans don’t taste anything like the chocolate bars we consume. After the cacao beans are harvested the cacao and pulp are fermented once fermentation is complete the beans are laid out to dry in the sun. Once dried the beans are then sorted and roasted. After the beans are roasted they are winnowed and finally the cacao nibs that are used to make chocolate reveal themselves. The cacao nibs are naturally bitter therefore sugar and other ingredients are added when making chocolate to reduce the acidity and bitterness and increase the sweetness. Sidney Mintz in his book Sweetness and Power reminds us that sugar and sweetness is introduced to us at a very young age , “the first non milk food that a baby is likely to receive in North American hospital is a 5% glucose and water solution used to evaluate its postpartum functioning because newborns tolerate glucose better than water.”(Mintz, 1985) The fondness for sugar influences the chocolate that we consume as “most Americans instinctively go for blends with a high West African cacao content – this is a dominant cacao in some mass-produced brands that most American have eaten since childhood that is naturally identified with full chocolate flavor. 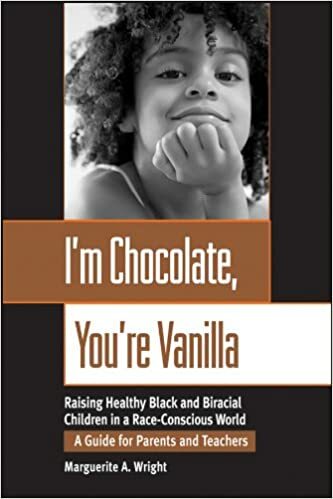 Americans gravitate towards very light chocolate.” ( The New Taste of Chocolate, p. 136) Sweetness is a preferred taste from a very young age Cacao and sugar go together sort of like peanut butter and jelly. Alone each tastes okay but together they taste wonderful. Chocolate has always evoked pleasant happy memories for me. 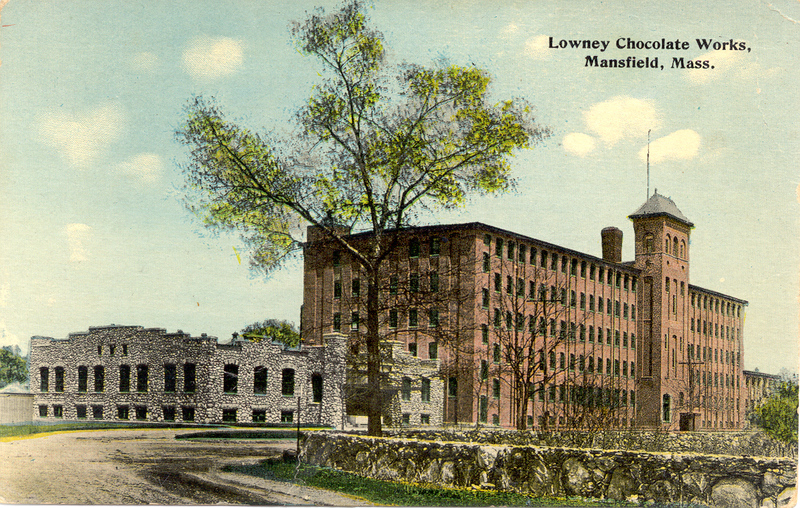 From my childhood I can remember the heavenly aroma of chocolate from the Lowney Chocolate Factory wafting through the air as we walked to school, the anticipation of devouring my grocery store chocolate Easter bunny after Mass and the way the chocolate icing on a Honey Dew Donuts éclair melts in your mouth in an explosion of chocolate mixed with Bavarian cream. As I matured my love of chocolate did not waver and I stayed loyal to brands like Hersey and Nestle and for special occasions Godiva was the go to brand. Then one day in 1987 a local chocolate shop called Puopolo’s Candies opened nearby. As a big believer in supporting local business I felt that it was my duty to check out the new chocolate shop. It was heaven! The aroma and the wide assortment of chocolate confections was astounding. There wasn’t a Snickers, Milky Way or Kit Kat in the place and it didn’t matter because these chocolates didn’t require brand recognition as one could see, smell and anticipate the chocolate truffles melting smoothly on your tongue while the milk chocolate flavors come to life. I never knew exactly why I came to prefer the chocolate sold at Puopolo’s over Hersey, Nestle or even Godiva, until now. The big chocolate manufactures like Hershey, Nestle and Godiva appeal to the masses for both taste and price of their products. The chocolate is made in huge factories using industrial equipment. Each batch of chocolate is made to taste exactly the same as the other so that there is no variation of taste, color or texture in the thousands of candy bars that are made each day. Chocolate manufactured in this manner is referred to as industrial chocolate. Shops like Puopolo’s are known as chocolatiers’ that appeal to people who appreciate and will pay for high quality chocolate . Chocolatiers’ produce chocolate creations on a much smaller scale and create confections in small batches by melting large bars of chocolate. Another player has come on the scene and companies like Taza chocolate are part of a growing movement of small companies that produce bean to bar products. The bean to bar companies are conscious of the long history of exploitation in the chocolate industry including children being used as forced labor on cacao plantations. (Off, 2006) The bean to bar companies produce an ethical and sustainable product by controlling all stages of their chocolate making including choosing and grinding their own cacao beans. The advantage of industrial chocolate for the consumer is that whether you purchase a Hershey bar in Alaska or Massachusetts the wrapper texture, color and taste of the chocolate will be the same. Whereas the smaller manufacturers including chocolatiers and bean to bar, aim to produce small unique batches of products. Cacao beans alone are bitter thus sugar and sometimes other flavorings like vanilla and milk are added to cocoa beans to make the chocolate bars more palatable. The more cacao content in a product the more intense the chocolate flavor which to many tastes bitter. Not everyone is lucky enough to have a local chocolatiers nearby so I set out to my local Trader Joe’s to utilize my new-found knowledge and analyze their chocolate section. Trader Joe’s shoppers are diverse and span the socio economic scale. They want to feel as if they are being socially and environmentally responsible without spending a lot of cash. They will however spend a bit more for a product if it makes them feel like they are achieving the goals of being a responsible consumer. One such chocolate bar checks all those boxes the Fair Trade Organic Belgium Chocolate Bar is included in the wide selection of chocolate products that are displayed throughout the store. These bars were included in the chocolate bar section located at the back of the store at the end of an aisle near the milk. The majority of the chocolate bars were 3.5 ounces with price points between $1.99 for the Fair Trade Organic Belgium Chocolate bars , $2.99 for a Valrhona dark chocolate bar and for $4.99 you could purchase a milk and almond pound plus bar. There were quite a few chocolate products located in the impulse buy zone at the front of the store including dark chocolate peanut butter cups and chocolate covered almonds for $4.99 each. As I strolled the isles I noticed some chocolate bars above the seafood section that had pretty and exotic looking labels. Upon closer inspection it is revealed that these are dark chocolate bars made with 70% cacao and delicious fillings like coconut caramel and toffee and walnuts. Along side these bars there was a 65% Dark Cacao bar that is made from single origin fairly traded beans from Ecuador. These chocolate bars highlight the cacao content to entice those that believe the claim that chocolate is good for your heart . However, James Howe advises that the claim that chocolate is heart healthy is not scientifically proven that chocolate consumption alone is the primary element in increasing cardiovascular health. ( Chocolate and Cardiovascular Health, 2012) The artwork depicts nature scenes to enhance the natural allure of these chocolate bars that are priced at just $1.89. In spite From the lovely artwork and detailed descriptions highlighting the cacao content and country of origin of the beans it is clear from the price points of $1.89 that these are mass marketed industrial made chocolate bars covered in cleverly designed Trader Joe’s wrappers. The wrappers contain all the buzz words and images the consumer wants to see so they feel like they are purchasing socially responsible products. When I questioned the store manager about the private label chocolate bars he did not know what company Trader Joe’s bought the chocolate bars from however he assured me that they were made from the finest organic ingredients yet… only a few chocolate bars are labeled organic or Fair Trade. 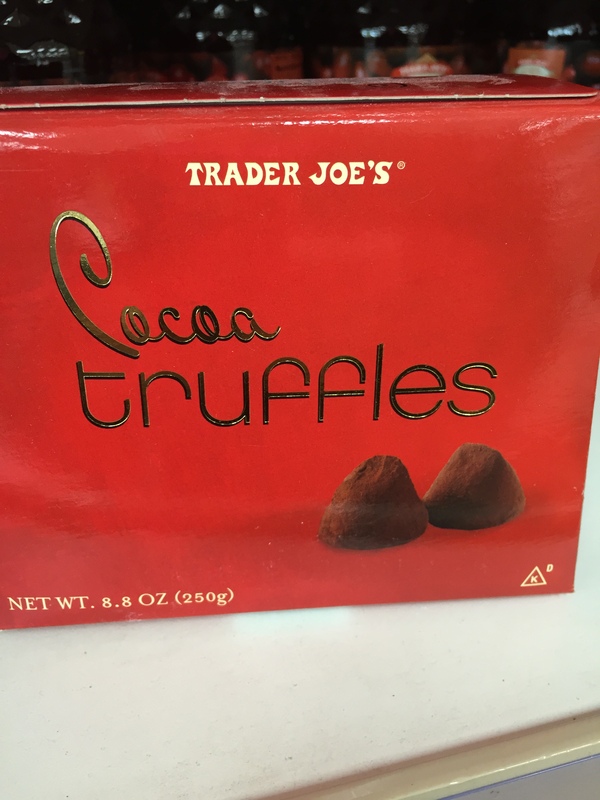 The Trader Joe’s Chocolate truffles look decadent on the shiny red background of the package. 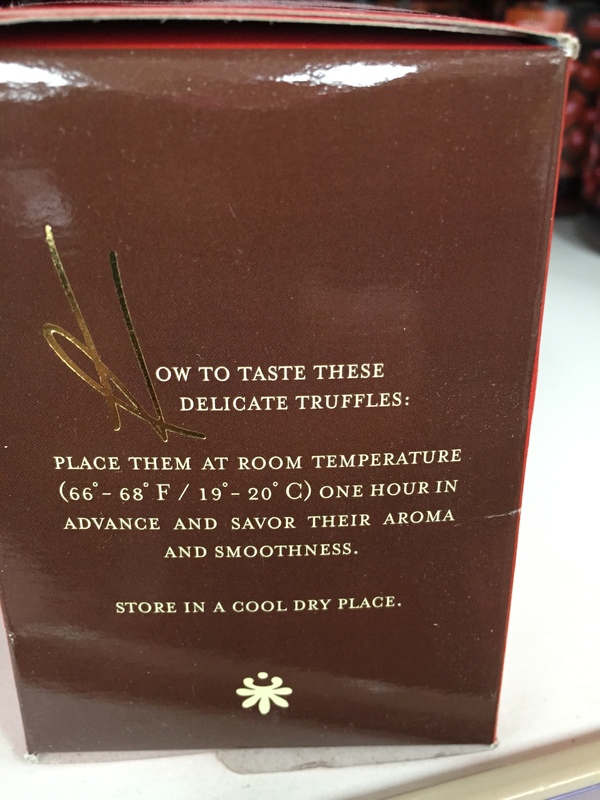 They even provide directions on how to”taste these delicate truffles”. Trader Joe’s selections so far were on target for their consumers, good cacao content, some organic selections. 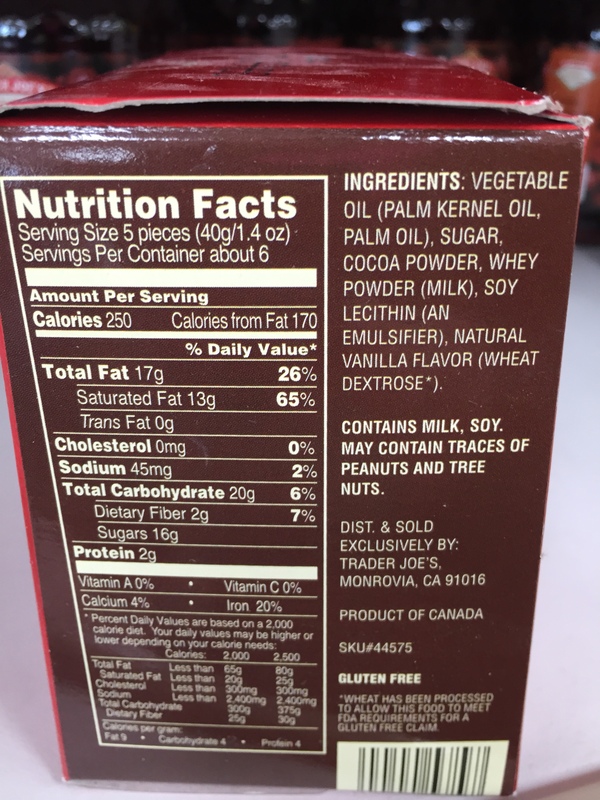 therefore I was very surprised when the first ingredient listed in the Cocoa Truffles was vegetable oil , the second sugar and finally cocoa powder appears as the third ingredient. This was disappointing as it is not as high quality chocolate product as it appears and not consistent with the prior products viewed. After reviewing the chocolate bar and other chocolate products at Trader Joe’s I’ve concluded that Trader Joe’s should expand their chocolate selections to include more Fair Trade chocolate products and add a few Bean to Bar and local chocolatiers products to the inventory. It would be a clear statement to Trader Joe’s customers and the chocolate industry that Trader Joe’s cares about ethics and is committed to providing their customers with more Fair Trade, organic and local chocolate products. While the typical Trader Joe’s customer appreciates a bargain , many would be willing to pay more for chocolate if they know that their purchase directly benefits the cacao farmer or the small business person. 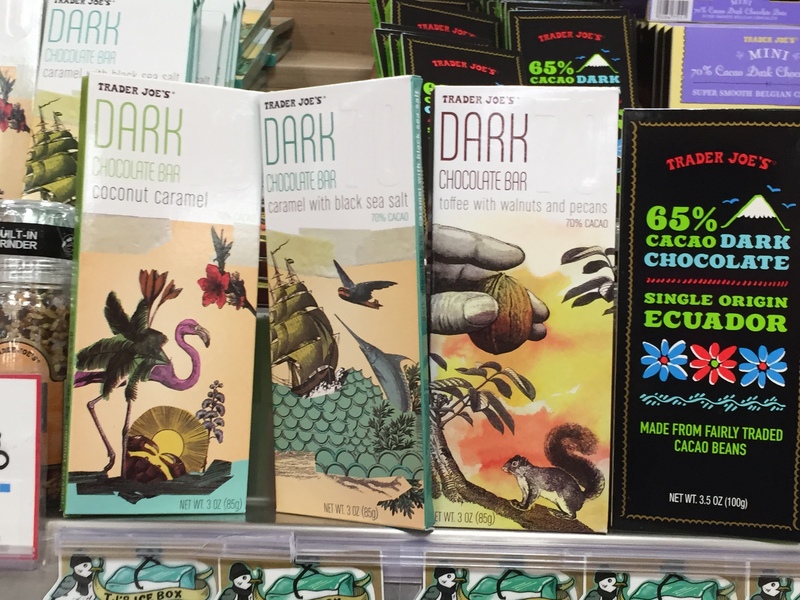 Trader Joe’s has the opportunity to make a difference in the chocolate industry if they go beyond selling private label chocolate bars and include bean to bar and local chocolate makers. If you want to make an effort to consume Fair Trade organic chocolate the key is read the labels or find your local chocolate shop , either bean to bar or chocolatiers you won’t be disappointed. “Chocolate and Cardiovascular Health: The Kuna Case Reconsidered.” Gastronomica: The Journal of Food and Culture 12.1 (2012): 43-52. Web. The New Taste of Chocolate: A Cultural & Natural History of Cacao with Recipes. Ed. Maricel E. Presilla. New York: Ten Speed, 2009. 61-94. Print. Carol Off, Bitter Chocolate: the dark side of the world’s most seductive sweet.2006. The New Press. print.